I published the below short article on our Facebook last month, but it is so interesting I thought I would share it here on the blog. During WW2, millions of letters were mailed to servicemen overseas every single day. This was great news for the soldiers, however the size of the mail oftentimes took up valuable cargo space on ships and planes. To solve the problem, the government created the Victory Mail system (V-Mail). Each letter that was sent V-Mail would be photographed & shipped overseas on a 16mm microfilm reels, then printed out and delivered. In the above photo you see a soldier holding up two reels of V-Mail film, contrasted by the corresponding number of letters below. It shows you just how powerful this new mailing system was! It's fun to look up examples of V-mail because besides the regular letters that were sent, servicemen would sometimes draw elaborate pictures or cartoons, humorously depicting the woes of military life. Below are some of my favorite examples. SeeBee, J. Spiegelberg, with tongue in cheek in this hilarious cartoon, assures Ruth Spiegelberg that he has ALL the comforts of his home back in the Bronx. Even running water! Everywhere. Though just a Corporal, Harve Chrisman has dreams of a great future for himself. Corporal Edwards forgot to leave out a few things when writing home to his parents. Thankfully, the censor was there to remind him. Thanksgiving grub, served up military style. Probably not as delicious as mother's home cooking. A letter from a Daddy (a paratrooper) to his children from "Somewhere in Italy." This letter and the following one are simply precious. 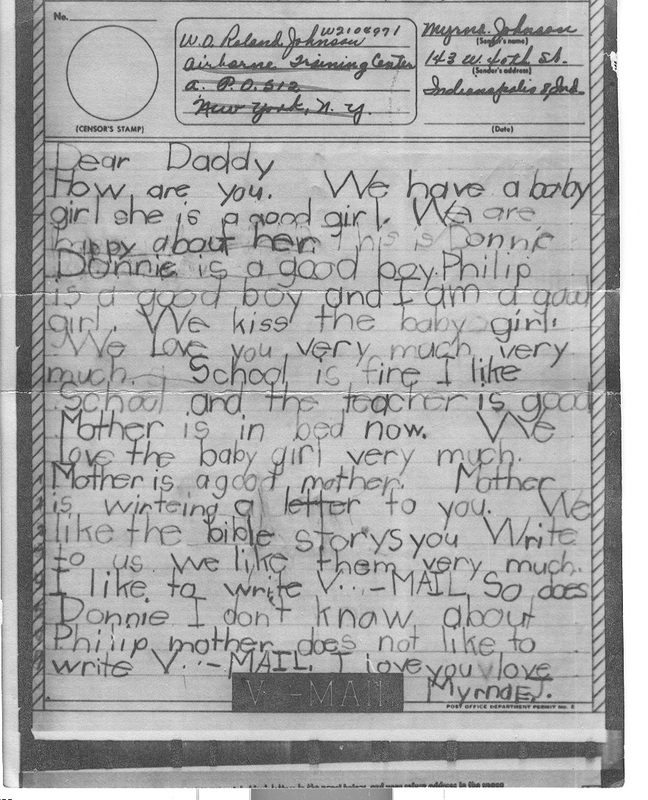 The paratrooper's letter made it to his children, and this is little Myrna's response. In different parts of the world, but PFC Raymer hasn't forgotten his anniversary. I hope you enjoyed these examples of V-Mail. It was a transition for America, but in the end V-Mail was a great success, freeing up vital space to transport Arms and Supplies for our soldiers overseas.